Mrs Dalloway by Virginia Woolf was first published in 1925. I think this is just the second book by Woolf that I’ve read. I read To the Lighthouse and it wasn’t my cup of tea although I know some bloggers loved it. I wasn’t any more impressed with Mrs Dalloway so I think it’s fair to say that Virginia Woolf and I just don’t get on at all. I just don’t like her writing style. The book has a short foreword by Jeanette Winterson who is obviously a fan and there is also an introduction by Carol Ann Duffy and as if that isn’t enough there’s another by Valentine Cunningham. 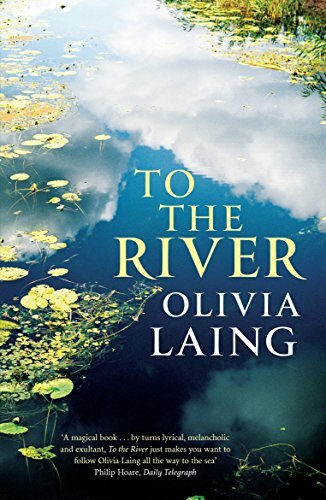 The setting is London a few years after World War 1 and Mrs Dalloway is giving a party later in the day. She’s in her 50s, a perfect hostess well used to throwing regular, fashionable parties. During the preparations for the party she sees Peter Walsh who has been in India for years, he had proposed marriage to her when she was a youngster but she had turned him down. Her mind wanders off over the years and over everything that has happened since then. Very early on in the book Woolf has a character who is suffering from depression and is preoccupied with suicide. Given what Woolf did to herself, I find it sad and unnerving to read about it in a book which was written years before she took her own life. Oh well, each to their own! I still have The Waves to read – sometime, maybe. The August prompt for November’s Autumn is a difficult one for me, it is: write a memorable quote from the book you’re reading. I’ve just finished Virginia Woolf’s To the Lighthouse which I bought a while ago. It turns out that this is the first book by Woolf which I’ve read, I must have been getting her mixed up with Vita Sackville-West! Anyway, I really wanted to like this book, for one thing Woolf’s maiden name is the same as my married name – Stephen – and believe it or not it isn’t all that common, in the singular. Also I love lighthouses and this book is set in Scotland, on the Isle of Skye. Apparently, it’s a modernist book and I obviously prefer old-fashioned ones. It’s quite autobiographical, the Ramsays are based on Woolf’s parents except the Woolf household spent their holidays in Cornwall, where they visited a lighthouse, she has transferred the action to the extreme north of Great Britain. I say action but in truth there’s very little action in the book, nothing much in the way of dialogue and although it’s set on a Scottish island, there’s hardly any description of landscape or atmosphere, it could have been anywhere – or nowhere. The youngest in the family, James is desperate to visit the lighthouse, but his father in particular seems quite determined to give him no hope of getting there, he’s a ghastly parent who has never quite grown up himself and prefers to behave like a cruel elder brother than a father. The one thing which stuck out for me in the book was the fact that Mrs Ramsay, who is a mother of eight, seems always to be knitting a stocking and she’s knitting it for the lighthouse keeper’s small son. I thought that there can’t be too many women who would be so generous when they have eight children of their own who would always be needing socks too. Do you know that artist Paul Klee? Actually I like his work, you can see some of it here, he said that when he was drawing he was “taking a line for a walk”. Well I feel that when Woolf was writing To the Lighthouse she took her pencil for a walk and she rambled and rambled, to very little effect, for me anyway. This is a paragraph from around about the middle of the book, just to give you an idea of the writing style, if you don’t already know it. You might like it, may think it’s quite poetic or something, thankfully we are all different! Night after night, summer and winter, the torment of storms, the arrow-like stillness of fine weather, held their court without interference. Listening, (had their been anyone to listen) from the upper rooms of the empty house only gigantic chaos streaked with lightning could have been heard tumbling and tossing, as the wind and waves disported themselves like the amorphous bulks of leviathans whose brows are pierced by no light of reason, and mounted one on top of another, and lunged and plunged in the darkness of the daylight (for night and day, month and year, ran shapelessly together) in idiot games until it seemed as if the universe were battling and tumbling, in brute confusion and wanton lust aimlessly by itself. ‘Woolf is Modern. She feels close to us. With Joyce and Eliot she has shaped a literary century.’ Jeanette Winterson. I’m not a fan of James Joyce either. 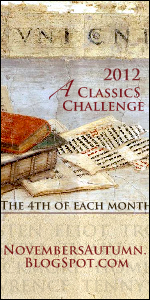 I had absolutely no intention of ever doing any more challenges but when I saw this classics one which is being hosted by Katherine Cox at November’s Autumn I decided to join in because it will fit in with my reading for 2012 anyway. It’s more of a bloghop really, with the action going on on the 4th of the month – which should be fun! I haven’t read any of these books before but they’ve been hanging around the house for years, patiently waiting to be read so this challenge is really going to encourage me to get stuck into them at last. It’ll be interesting to see what the other people involved in the challenge are planning on reading too. Thanks Katherine, for organising it all. You know what it’s like when you look forward to something for ages, you can almost guarantee that you’re going to be disappointed. Well that’s how I felt when I got to the library sale at the Adam Smith Theatre last Saturday. Mind you after having perused my haul again – I’ve got a bit of a cheek not being happy with it, it’s just that I didn’t get anything which I had really been looking for. I must admit that I prefer Heyer’s detective stories to her romances but I’ll get around to these ones sometime. Nigel Tranter is a Scottish writer who writes good historical fiction. I can hardly believe that I’ve not read To the Lighthouse yet. I enjoyed Updike’s Rabbit series so I thought I’d give this one a go although it seems to be very different being about the king and queen of Denmark before the action of Shakespeare’s Hamlet begins. Neil Gunn is another Scottish author of the 1930s. I had meant to borrow something by Judith Lennox for a while now but hadn’t got around to it. Flambards was a bit of pure serendipity because I had seen the book somewhere on the internet just a few days before and I hadn’t even realised till then that it was a book. I really enjoyed the series of that name when it was on the TV years ago. This was in the childrens section and I left it until late on before picking it up in case a kiddywink should want it – but it was left there looking forlorn so I didn’t feel that I was depriving anyone of it. The Borley Rectory Incident is another junior library book and it’s written by the chap who wrote a lot of the Doctor Who books. Gordon went through a phase of wanting those books as bedtime stories and I just want to know what this one is like compared with them. Now that I look at them all carefully I don’t know what I was moaning about at the beginning of this post, I’m quite pleased with my haul. Now I just need the time to read them all.